Stuffed grape leaves can be very healthy if made the correct way with little oil and fat. Stuffed grape leaves do take time to make, but once they are made you will see that they are worth the wait. Stuffed grape leaves are best made when a friend is present. 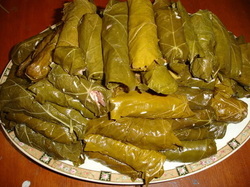 If you are celebrating Ramadan in the fall or winter months then use canned grape leaves. Rinse the rice under the water several times. Then place the rice under warm water for 1/2 hour. Make sure to trim all the stems off of the grape leaves before beginning. Bring a large pot of water to boil. Blanch the grape leaves by placing them a few at a time in the salted, boiling water. Wait for the leaves to turn color slightly and remove to drain. Set the leaves aside, while you prepare the rice. Drain the rice and add in the curry, cinnamon, salt, pepper, 1 teaspoon of the oil and half of the bouillon cube. Mix the rice together well. Add in the chopped tomatoes and the meat. Take one olive leaf and lay flat on the table. Add in one teaspoon of stuffing in the middle of the olive leaf. Begin by folding the bottom of the leaf over the stuffing and tucking in both sides. Continue to roll up all the way to make it look like a cigar. Place the sliced tomatoes in the bottom of a heavy saucepan. Place the green onion in the middle of the pan on top of the tomatoes. Start layering the grape leaves on top of the tomatoes in a very uniform manner. When you have finished the last leaf, lay a heavy plate or lid on top of the leaves so they can not move around. Fill the pan up with water to one inch above the leaves and the pan lid. Add in 2 teaspoons of salt, the other half of the bouillon cube and the rest of the oil. Place a lid on top and bring the leaves to boil. Let the grape leaves cook for 1/2 hour and then check the water. Add enough water to continue cooking and cook for another 1/2 hour. When the leaves are done, drain all the water off the leaves and invert on a large serving plate. Serve the grape leaves with lots of yogurt.